Most people are familiar with woks, which are used in virtually all Asian cooking. In Thailand, we use some equipment, like a sticky rice steamer and basket, that are not used as much in other Asian countries. A kloke, or mortar and pestle, is another tool that's used a lot in Thai cooking, both to make Som Tum (Green Papaya Salad) and to pound ingredients used to make Nam Prik (dipping sauces) and curry pastes. Much of the equipment shown here is available for purchase at Asian markets. The stone mortar and pestle (on the right) is made from carved granite and it's used to pound curry pastes and other dried spice ingredients such as coriander seeds, cumin seeds, cloves and dried peppers. 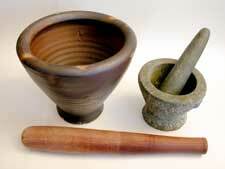 The mortar on the left is made from clay and the pestle at the bottom is made from wood. This kind of mortar and pestle is commonly used for pounding green papaya salad (Som Tum), fresh peppers, fresh garlic and more. This steaming basket is made from woven bamboo, which keeps the sticky rice from getting too wet during steaming, and it sits in an aluminum steaming pot. Water is placed in the bottom of the pot and it's brought to a boil. Sticky rice, which has been soaked overnight (or for at least 3 hours), is placed in the basket. The rice should steam for approximately 15-20 minutes or until it turns translucent. 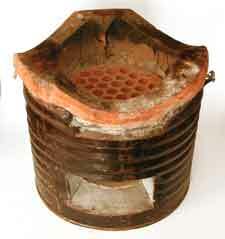 Any round pot cover can be placed in the basket in order to keep most of the steam from escaping. 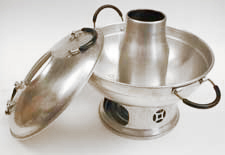 This three tray aluminum steamer comes in a variety of sizes. It's used for steaming fish, vegetables, tapioca dumplings, and chicken. Water is placed in the bottom tray and it's brought to a boil. Oil should be rubbed on the trays before using to keep the food from sticking. 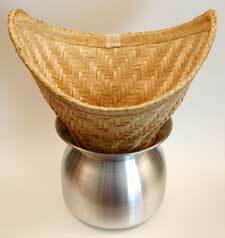 A big sheet of banana leaves is often used with this type of steamer to wrap up food prior to cooking. 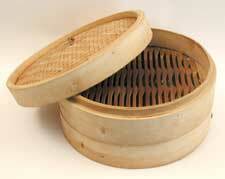 This is a bamboo steamer tray that's mostly used to steam foods like dumplings, chicken or pork meat, and vegetables. 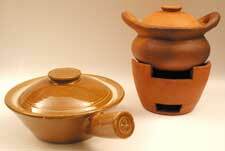 Bamboo steamers come in a variety of sizes and are available at most Asian markets and online. 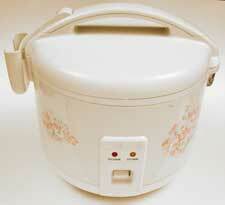 This electric rice cooker is the most convenient way to cook rice and you'll find one in most homes in Asia. The rice cooks in just 5-10 minutes and after it's cooked you can leave it in the rice cooker to warm until it's ready to serve. Rice cookers come in different sizes, depending upon how much rice you eat and how many people you're cooking for. Common sizes are 3, 5, 8, and 10 cups (commercial rice cookers can cook up to 60 cups at once). 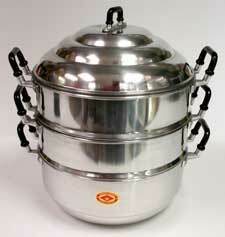 Rice cookers are available at most Asian markets and online. This Thai hot pot with lid is made from aluminum and we use it to serve soups like Tom Yum, Hot and Sour Soup (Gang Som Pae Za in Thai) and Tom Kha Gai (Chicken Coconut Soup). Charcoal is placed in the bottom of the pot (sterno cans are used in US), which keeps the soup warm during a meal. Thai Hot Pots are sold at most Asian markets and online. In Thai cooking, a good wok is very important! A non-stick frying pan is easiest for stir-frying noodle dishes like Pad Thai or Fried Rice. Stainless steel or cast iron woks are best for stir-frying vegetables and meat. The woks we use in the restaurant are hand-hammered cold-forged steel. The clay pot on the left is used in the oven to cook dishes such as Seafood with Silver Bean Thread Noodle (Woon Sen Ob Talay in Thai) and Pineapple Fried Rice with Shrimp in Clay Pot (Kao Ob Saparote in Thai). The clay pot on the right is used for soups like Tom Yum. Charcoal can be put in the bottom to keep the soup warm during the meal. 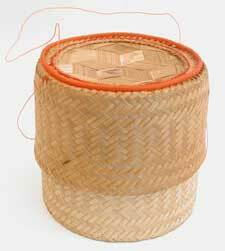 This sticky rice serving basket is perfect for serving sticky rice. The woven bamboo allows the rice to breathe a little and yet it keeps some of the heat in as well. In Thailand, rice is never left uncovered during a meal, so the bamboo server also helps with that. Some baskets come with brightly colored woven bamboo and are very decorative as well as functional! 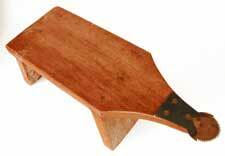 This little wood stool with metal teeth on one end is used to extract the meat from a coconut. The coconut is cracked open and the metal teeth loosen the meat from the shell so it can be used to make fresh coconut milk. This type of charcoal grill has been used in Thailand for a long, long time! Hot coals are placed in the bottom of the grill and a wok sits on the top. The grill is essentially a metal pail with concrete inside formed into a space that holds charcoal (which is added through a hole cut into the side). A ceramic piece holds the wok above the coals. Some of the utensils commonly used in Thai cooking include a spatula, which is used for stir-frying and works well when making Pad Thai and other noodle dishes. Cooking chopsticks are very helpful when making noodle dishes such as Pad Thai or Drunken Noodles because they help lift up the strands of noodles so the sauce can cover each noodle. 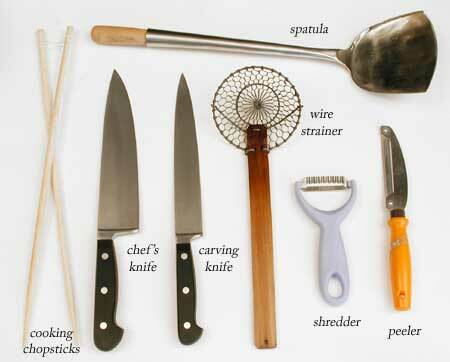 Knives such as a chef's knife and carving knife are very important as well as a cleaver (not shown). A wire strainer is usually made from either copper or steel wire is works well when deep-frying. A shredder works well when making Som Tum to cut the unripe papaya into long thin shreds. A peeler works well with fruit or vegetables prior to cooking.